were - to the very last minute - a chance to lose it. Ever since I was first licensed as G4iFB in 1979, I’ve kept notes on contests in my station notebook in order to compare my claimed scores against the adjudicated results, set myself improvement targets for next time and remember the highs and lows of each event. Some of those notes and the results I’ve achieved are repeated below (mostly for my benefit not yours!). FOC Marathon : I wasn’t planning to enter this but got sucked in by the fun of catching up with old friends and making new ones. 80, 40 and 15m were wide open to NA but I found working Europe a struggle this year. CQ DX Marathon and CDXC DX Marathon - these DX challenges are ongoing all year, as always. ARRL International Grid Chase : chasing grid squares is a bit too much like Bingo or Battleships for my liking but it’s nice to be able to hand out a relatively rare grid, and fun to see how much of the planet I can contact in the year. I’m proud of my 1290 unique grids, placing me 19th in the world on that criterion. It looks as if most of those who worked more grids than me were simply working anyone, promiscuously and in some cases robotically making as many QSOs as possible during the year, whereas a handful of us took a more selective, dare I say refined approach. SM2SUM’s 1400 unique grids is a remarkable score, given that he was 332nd overall but 3rd on unique grids. Now that’s a real DXer at work - well done Peder, an awesome result from SM-land! CQ DX Marathon and CDXC DX Marathon - we’re waiting patiently for the results of both. FOC Marathon - I made just under 250 QSOs this year, placing a mediocre 4th in the Oceania open QRO section. BERU - I joined a North Island team (unofficially dubbed the “Call Blacks” although team leader Frank ZL2BR entered us as the dull-as-dishwater “Team NZ North Island”). The contest was tough going. Claimed 4,480 points from 250 QSOs. The checked score of 4,445 (less than 1% down) put me 7th overall and FIRST in Oceania in the Open-SOA section, narrowly beating VK4CT - who operated just 12 hours. Overall, a much better result than I expected. Team NZ North Island narrowly beat the Quake Contesters, our pals on shaky South Island - a close-run thing. ARRL DX CW - I went to Holger’s to join ZM4T for a multi-single high power entry. We made 2,356 QSOs and 233 multipliers, claiming 1,644,744 points. After checking, our final score ended up at 1,599,312 (less than 3% down) placing us FIRST in Oceania and 17th in the world - a pretty good result for the team. Although 4 Hawaiians scored more than us, they were either multi-multi or single-op stations, fortunately. ARRL DX SSB - not my favorite event or mode but, still, not a bad way to spend a Sunday. I made 1,145 QSOs and 172 mults, claiming 581,000 points. Placed FIRST in ZL and 3rd in Oceania with 577,128 points, losing just 0.7% in checking. Fantastic! CDXC LF Challenge - I placed ~7th with a total of 117 DXCCs and 867 QSOs worked on 40 & 80m during March . SP DX - I worked 64 Poles on 40m CW just for fun on our Sunday evening. Received a nice certificate for FIRST in ZL with 2928 points - albeit probably the only ZL entrant! All Asia CW - operated 5½ hours, claiming 10,220 points on 15m single-band high power assisted from 140 QSOs. Condx OK to JA but not to the rest of Asia. CDXC HF Challenge - placed 14th (12th of CDXC members) in the league with 71 countries worked on 15/12/10m during September. Oceania DX contest - condx lousy and too much else on the go to enter this year. CQ WW SSB - I made a brief appearance at the club but declined to operate this year. ZM4T did fine without me! CQ WW CW - had a blast at ZM4T with friends Holger ZL2IO, Xenia ZL4YL and Jackie ZL2CW. CQ DX Marathon - we are patiently awaiting the painstaking adjudication and results. My score was lower than recent years for several reasons: poor conditions, storm damage to my LF antennas, too much work and too much time filling digimode slots on FT8. BERU: I spent most of the day on a family outing but managed to slip away for a few hours in the chair for this historic contest. Fruitlessly calling 3C7A on 15/CW cost me a couple of hours of peak BERU time but it would be an ATNO and he’s a good op so I seized the chance ... and then forgot to revert the keyer to my contest call until 4 QSOs later. Ooops. Because of that, I expect my final score to be about 3,000 points. I ended up in 30th place overall and 6th in ZL with 3,115 points, just ahead of my pal Holger ZL3IO using ZM4T. Holger could only manage a few hours on-air too, due to competing in a triathlon. Oceania DX SSB - I made a few token QSOs but decided not to enter. 343k points would have been a new ZL record for 15m HP assisted ... but Wes’s record stands at 189k points. Lesson learnt! I lost less than 2% in checking. We were the only ZL entrant in that section. We lost a disappointing 8% in checking including 12 mults. I placed 3rd of CDXC members and equal 5th overall. CQ DX Marathon : I claimed 317 points, the same as last year, and won the Oceania plaque again :-). A ZB pirate cost me 1 point in checking (grrrrr). I logged other ZBs during the year but unknowingly claimed the duff one. REF CW: I made a more concerted effort in the contest this year, especially on LF. Two French QRP stations emailed me their thanks for our 80m QSOs - nice! 120 QSOs (three times as many as last year) netted me a more respectable 35,200 points (ten times last year’s effort) and another smart certificate for FIRST place in Oceania , again. FOC Marathon: this was a half-hearted effort in the contest but as always I enjoyed catching up with FOC friends. Marconi Memorial : what a star, that clever Marconi bloke. After all the fun I’ve had on amateur radio over many years, it seemed fitting to enter a memorial contest to commemorate him. My score of 71,565 points (single op, high power) put me FIRST in Oceania and New Zealand, and 36th in the world. SAC CW : given declining HF conditions and lots of outside stuff to do, I decided to enter the low-bands section this year on 80 and 40m, single-op assisted high power. It turned out to be a miserable rainy Sunday in NZ so I worked during the daytime, and enjoyed the dawn and dusk periods playing radio. For no obvious reason, 80m was an almost complete washout but 40m was pretty good. I made about 90 Scandinavian QSOs and claimed just over 9,000 points, placing FIRST in Oceania (albeit the only Oceania entrant!) and 24th in the world out of 36. Oceania DX Contest I submitted a checklog for this event since I’m on the organizing committee. CQ WW CW : the annual blast, tempered by a tough week before, teaching in VK2, flying home just in time to make the start. I managed ‘just’ 23½ hours in the chair. 80m was in good shape on Monday morning, despite QRN and a severe caffeine deficiency. I probably should have opted for an 80m single band entry but I had fun chasing around after 2015 DX band-fillers towards the annual challenges. An auroral opening on 15m a few hours before the end brought a string of strong raspy sigs from Scandinavia over the North pole. My final score was 656,640 having lost 36,000 points (5.2%) in adjudication - not a good year but enough for FIRST in ZL and 2nd in Oceania. CDXC DX Marathon Challenge is over for another year. I led Oceania by a comfortable margin and ended about 5th in the world rankings (of CDXC members anyway). CQ DX Marathon : I claimed 317 points from 277 CQ countries and all 40 CQ zones, a personal best with 8 more countries than 2012 (a 2½% increase). I won another very nice plaque for FIRST place in Oceania . REF CW: I only made 37 Coupe du REF QSOs to earn just 3,000-odd points, but that was enough to win in Oceania! Hopefully next January I’ll make a more serious effort to give away the ZL multiplier, and clearly I need to do something dramatic to improve my abysmal error rate having lost 28 % in checking despite my low QSO count! Guess I just wasn’t paying attention. FOC Marathon: yet another casual entry, catching up with friends. No entry from me. ARRL DX: I wasn’t planning to enter but HF condx were so good that I got sucked in. I made 775 QSOs and 211 multipliers on 80-10m, giving me just under half a million points claimed - not bad given that I took several hours off for work, caught up with some gardening and, on Sunday afternoon, went to Holger’s to operate ZM90DX for a few hours as I had promised to help them out. Holger ZL3IO and Wes ZL3TE were operating quite seriously, so I was a bit embarrassed to turn up so late and leave so soon but I really couldn’t spare the full 48 hours for a serious entry this year. Sorry lads! 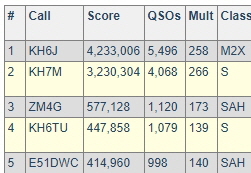 As ZM4G I scored 479,028 points from 768 QSOs and 209 multipliers, running single op assisted high power, while ZM90DX made an impressive 3,492,693 points from 4,247 QSOs and 277 multipliers multi-two. Both entries placed FIRST ZL in their respective classes ... and were also last in ZL. Work it out. BERU: I made a massive strategic error by not staying up all night from the 11pm local start of the contest this year. When I finally, reluctantly dragged mys elf out of bed at 4:30am, I found the high bands full of beans and my friend John ZL1BYZ giving out serial numbers in the low hundreds already. Doh! I’d clearly blown it before I even started! The morning session was not bad with the usual dip around the middle of the day while the afternoon/evening session was full-on. 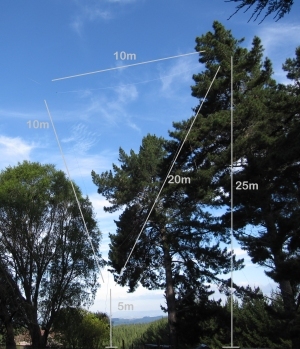 Although I did succeed in getting another rope over the fir trees to lift the 40m loop further into the clear (albeit in a plane due N/S, the worst possible direction for working the UK! ), I didn’t finish putting up a new 80m loop in time for the contest - perhaps a good thing because 80m was a wash-out with high band noise and weak signals that would definitely have cast doubt on a shiny new antenna! 40 through 10m were wide open in the evening, and I was surprised to catch Roger G3SXW running just 5 watts on both 40 and 20m. DROM Dave G4BUO was as loud as ever, even on 80m where his 4-square certainly earns its keep, a distinct advantage over the few other G’s that I heard on 80. There were other nice surprises from various far-flung parts of what remains of the once great British empire - aside from the UK, VK and VE, I worked 8Q7, 9J2, 9V, VK9X, J3, P29, ZS, P3, 9H and others, although some of them were not actually participating in the contest. Still, 400 QSOs and 6,000 points tells me it was a good year, on a par with 2010. I placed 13th overall and FIRST ZL in the multi-op [really single-op-assisted] section with 5,850 points (97% of my claimed score - I’m happy with that). The only other ZL entrant in that section was Holger ZL3IO. CDXC LF Challenge: I worked 108 countries on the three low bands this year, ending up in third place sandwiched between my pals G3SJJ and G5LP. 80m had been a slog lately with weak signals and high QRN on my inverted vee dipole. I had cunning plans to erect an 80m loop in the trees for the Challenge but a stormy weekend wrapped the ropes tightly around 3 high branches, while continuing bad weather throughout March put paid to that idea. Oh well, no danger of a drought this year! The 40m loop was working well, and I still haven’t got around to putting up a topband antenna. Gagarin Cup: I had a play in this contest to commemorate the Russian astronaut and first man in space Yuri Gagarin, working only 20m single op unassisted with 500W. I made just over the 250 QSOs needed to qualify for a certificate, with a claimed score of about 20,000. Lots of casual callers didn’t realise I needed their ITU zones, fair enough, but many of them were evidently incapable of understanding or responding to “UR ITU ITU ZONE?”, even if I slowed down and sent it quite carefully, such is the poor state of CW these days. Trouble with my wireless keyboard made logging almost impossible at one point, so apologies to those who called but to whom I didn’t respond. The problem is intermittent, possibly conflict with another wireless keyboard in the same room. Eventually, the two systems seem to establish a truce and everything works nicely, for a few months! Oceania DX Contest CW: I entered single-op single-band 80m, making a little over 60,000 points. As far as I was concerned, it was a dreadful slog, not much fun at all. My fault I guess for choosing 80m at sunspot max! The two highlights were working LA7DFA who said in a cluster spot “Thanks for the new one on 80!” and 2SZ, the special UK callsign commemorating the 90th anniversary of the first round-the-world contact between Mill Hill School near London and Shag Valley, South Island NZ. CQ WW CW: I joined some pals in VK4 for a multi-multi entry as VK4KW. HF condx were pretty good and the station on a quiet rural sit e 2 hours NW of Brisbane is competitive so we h ad a blast. Including dupes we made just over 10,000 QSOs and DXCC on 10 thru 40m, claiming 22 million points and beating the previous VK MM record by a huge margin. We were placed FIRST in VK, SECOND in Oceania and 18th in the world. We worked all 40 CQ zones but not on any one band. The ace team was VK2IA (Bernd), VK3MI (Brian ex-ZL1AZE), VK4CT (John ex-VK4EMM), VK4BAA (Phil ex-G0HSS), VK4SN (Alan), VK4TS (Trent), VK4NEF (Eric), VK4NDX (Dave) and me. Being called by 3B8 and 8Q7 on 80m were my highlights of the weekend. Topband was disappointing at this time of the sunspot cycle. ARRL 10m: this was another unplanned entry. I had things to do on the farm but rotten weather put paid to outside work so I had some fun with “low power” (150W) CW and cluster, scoring about 400,000 points from 700 QSOs. Some US stations couldn’t hear me at all (NN3RP and W7CCE for example), most had trouble, but some have great hearing. Most amazing of all was EI7M, worked on a skew path with both us beaming at NA. My signal was barely audible there but the excellent operator persisted to get the full exchange. I can almost see Lee ZL2AL’s QTH from here but he was CQing endlessly and clearly not hearing me or other callers: I phoned him to check and, sure enough, he had gone to lunch, leaving the keyer loop running by mistake. Busted! 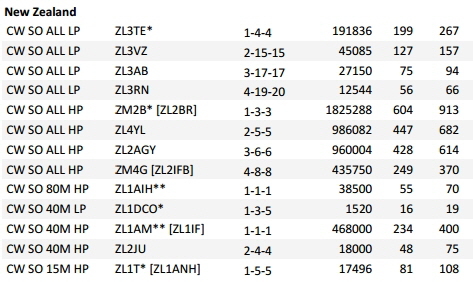 I missed the ZL record by 100k, and wished I had operated more than 22 hours. My final score was 395k, just 2% less than I claimed: I’m happy with that! I placed 50th out of 1,785 DX entrants in my power class. CDXC Annual Challenge another good year: I was FIRST in Oceania! 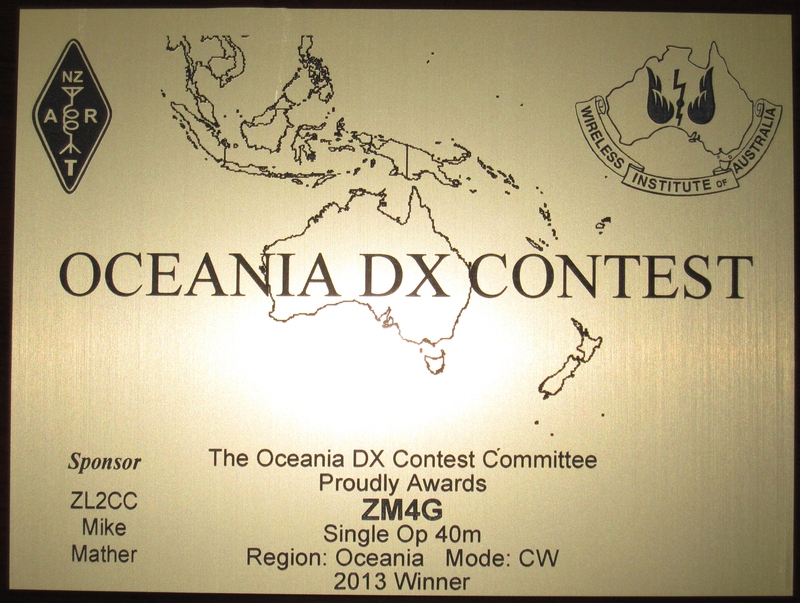 CQ DX Marathon : I won another very nice plaque for FIRST in Oceania. Thanks anonymous donor! FOC Marathon: another casual operation - a few hours’ fun, not worth entering as such. BERU: a very casual operation, just not in the mood this year. CDXC LF Challenge: placed 20th with 60 DXCCs on 160/80/40 and 80 slots filled. CQ WPX CW : due to an IT crisis in the office, I could only spare a few hours to help fix the 15m beam at the club and operate the first hour of WPX. IOTA: made 7 QSOs, definitely not enough to bother entering this year. FOC BWQP : another hours’ casual fun catching up with old friends. Worked just 15 members to be placed 3rd to last. CDXC HF Challenge: I finished 27th out of 50. Hardly an outstanding performance but fun. Oceania DX Contest SSB : the East Coast Contesters decided to make a club entry in this event for a change, so several of us operated under our personal calls from home or at the club site with a target to make at least 50 QSOs each. I got a bit carried away and made 498 (504 less dupes and one late QSO: I forgot the finish time!) all on 40m . I would have made a few more except we had visitors on Sunday ... and I still don’t like SSB. I built a new 40m antenna for this contest, a fullwave wire loop suspended from a convenient fir tree with the highest corner about 25m up . It took a few hours of messing around to figure out the right directions, len gths and tensions for the halyards and to tune the loop to resonance but it works perfectly, while the little old fishing-pole vertical did its bit as a diversity RX antenna. With few exceptions I had little trouble hearing callers but occasionally I could have done with more than 500W out, or a different voice (how does “three” or “threeeee” or even “treeeeeeeeeeeeee” come out sounding like either 2 or 4 - but not 3 - at the far end?!). For the CW leg I might see if I can get the old LK550 amp out of retirement, and maybe I should rig up a change-over system to be able to transmit on either antenna at the flick of a switch. A major highlight and quite a surprise was the lack of QRM from over-the-horizon radar and YB pirates on 40m all weekend. My claimed score was about 655,000 on 40m SO HP assisted. I won the 40m Oceania plaque donated by my friend Mike ZL2CC. My score placed me 4th overall in ZL, not bad considering there were 30 ZLs active, mostly multibanders. I was beaten by Rick ZM1G (ZL2HAM ) who was doing rather well every time I heard him, plus ZL2AL (Lee and pals at ZM4T club) and John ZL1BYZ hoovering up the points. Oceania DX Contest CW : I gave the 40m loop another good workout on my favourite mode, operating single-op high-power single-band 40m. I made 712 QSOs. High QRN made it hard going, so much so that I gave up half an hour before the end: I was really struggling to copy callers and felt it was unfair on them to drag out the QSOs, especially as there was a risk of me mis-copying their calls. 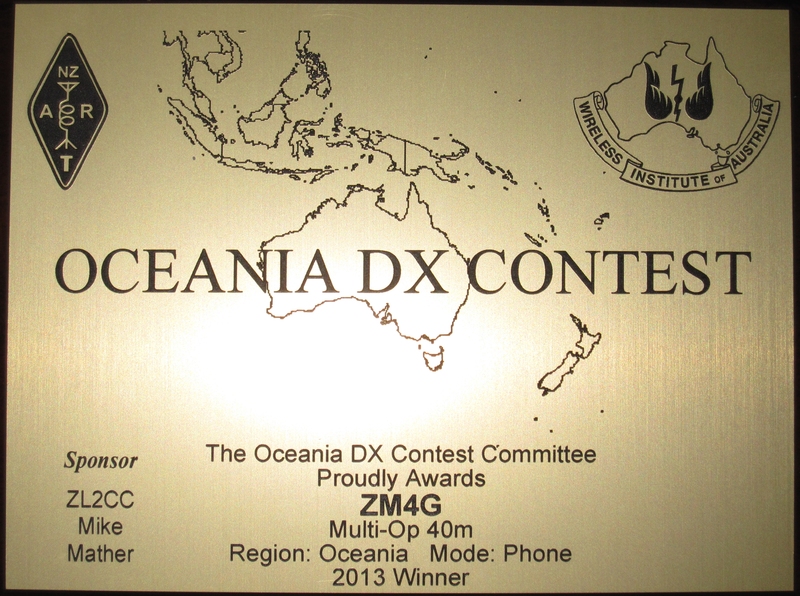 Still, I won another plaque for #1 Oceania on 40m: tnx Mike ZL2CC! Once more, I was 4th overall in ZL, beaten by the ZM1A club, ZM90DX and ZL1BYZ, all multibanders. The loop is a keeper! CQ WW SSB : ZM4T mustered just 5 SSB ops this year, just enough to have a go at a multi -multi entry. Our claimed score was 7,601,696 from ~5,500 QSOs. CQ WW CW : the club’s 5 CW ops valiantly made an assault on the ZL multi-two record, hoping to complete the set of four (CW and SSB, multi-multi and multi-two). We made just shy of 7,000 QSOs and 13.7 million points, not a bad effort! We were unable to run the Athena stats package live during the event as planned on a separate stats PC since the N1MM contest logging software steadfastly refused to let us add the third PC to the network. With hindsight, we probably should have configured N1MM for multi-multi since it worked nicely in the SSB leg. We would have lost the multi-two function that warns about excessive band changes, but that wouldn‘t have been an issue as it turned out. We live and learn. ARRL 10m: with such good HF conditions, this would have been fun to enter but I had other, more important things to do. I made about 60 casual QSOs, mostly giving points away to my FOC pals and filling a couple more band-slots. 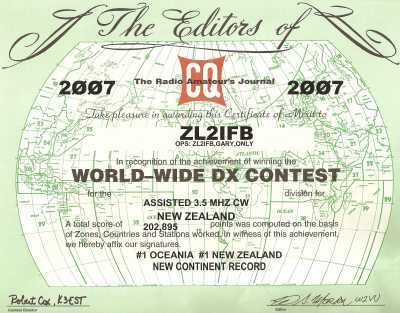 CQ DX Marathon : my score wasn’t good enough to win Oceania again but I placed FIRST of not-very-many entrants in ZL. FOC Marathon: yet another casual entry - I could only spare a couple of hours. BERU: 80m was busy with weak Gs around their sunrise, and quite a lot of them stayed aroun d getting stronger at our sunset. 40m was noisy with OTHR the first evening, but noisy with Gs the second! 20m was the money band, but not much in the way of runs as usual for BERU (lots of S&P). LP stayed open to G until the end here. 15m was patchy, with a few bonus Gs in the last hour, SP. ZL2BR Frank's predictions were excellent, as always. 10m was mostly dead as a dodo ... but I was delighted to be called by 6Y0A off the back of my beam while I was calling ZL1AMO on sked having QSY'd from 15m. Wkd just 1 African: 5N7Q long path on 40m (thanks to his huge rotatable commercial shortwave broadcast beam). No VUs either, as far as I recall. One 4S7. Missed ZD7XF. Wkd a steady stream of VKs and ZLs and A35YZ split on 3 bands (though he’s not in the contest). Everyone was polite, with no serious QRM - just a few persistent non-BERU stns (fewer than normal). Glad to have the no-tune KPA500 for lots of quick QSYs, trying to find any kind of opening. Thanks to fading alarm clock batteries that finally died at the vital moment, I missed my 5am intended restart on Sunday by 2 hours! Bottom line: disappointing but not surprising with all those flares and a very disturbed ionosphere. CQ WPX CW: I dragged the dusty old LK550 amp out of retirement for this one, and what a difference 3dB makes! The 500W KPA500 does just fine for regular DXing but thanks to our newly increased ZL license limit, I appreciate being able to use the full kW in contests. The Reverse Beacon Network’s Skimmer spots also make a huge difference in CW contests: after the first day, I spent most of my operating time just working methodically through N1MM’s extensive menu of juicy multipliers on the band map instead of the usual slog of CQing interspersed with search-and-pouncing. Lacking the KPA’s instant no-tune band-changes, I decided to stick to 15m throughout and found it fascinating to track the changing propagation hour-by-hour. The K3’s outstanding dynamic range and superb filtering let me get up close to some huge signals with very few problems apart from the odd clicks and buzzes from older/crappy trans mitters and over-driven linears. Noise-cancelling Sennheiser headphones helped me concentrate hard over the amplifier’s fans. My claimed score looks good (7th in the world and 1st in Oceania - but boy are those claimed scores close! ), beating previous Oceania records easily and hopefully more than enough to reclaim my 15m record from KG6DX but conditions were up so I expect many records have fallen. Friends Holger ZL3IO and Ken ZL1AIH (ZM1M) were both QRV on 15m and were doing well whenever I heard them, while it seems certain that Wes ZM3T (W3SE) has decimated my pathetic 10m record. PS The adjudicator’s report shows I lost 3.7% of my score in checking due to errors: I’m pretty happy with that: while an error-free log would be wonderful, I’m glad that my error rate is well below 5% overall, and especially the 0.5% busted calls. FOC QSO Party (Bill Windle memorial): I scored 80 QSOs with members + 44 with non -members, and enjoyed brief chats with many of them. Oceania DX Contest SSB: I was at the club operating ZM4T as usual, but not many hours this year. Oceania DX Contest CW: I may not get to ZM4T due to other commitments. CQ WW SSB: I may not get to ZM4T due to work. CQ WW CW: I was at ZM4T for the duration. CQ DX Marathon : I won the Oceania section with a score of 309 (269 countries plus all 40 zones) and received a very handsome plaque that still graces the wall of the shack. BERU: due to antenna issues and other priorities, I could only manage a casual entry on 40 + 80m. Condx were not good but it was fun to catch up with a few friends from the UK. FOC Marathon: another casual entry on 40 + 80m plus 1 token QSO on 15m. It was great to catch up with so many friends but hard going on 40m due to the Black Sea contest (which no doubt was much more of an issue in EU) and VP8ORK parked on 7024, QSX 7025ish (FOC’s preferred frequency). Such clashes are unfortunate and always create aggravation, but it’s not obvious how to avoid or resolve them. All I can say is that every single FOC member I worked was polite and friendly, some even kindly standing by on their frequencies when someone else tail-ended, giving me the chance to make a quick QSO then QSY. IARU HF World Championship: I had completely forgotten about even entering this contest until a certificate for FIRST in ZL and ITU zone 60 turned up out of the blue 13 months later! CQ WW CW: I made time to enter CQ WW CW with my East Coast Contester friends at ZM4T. We beat the previous ZL record but we were soundly beaten by our friends from Auckland: a late start caused by problems with the 10m beam didn’t help but that’s not enough to account for the losing margin. Well done Jacky and Aki! BERU: claimed around 6,000 points from 469 fun-packed QSOs for the ZL team, the Call Blacks , one third up on 2009. Given that BERU coverage is brand new in N1MM and it is an unusual format, I'm not surprised if there are a few bugs in there. It doesn’t seem to have counted ZK3 for example but I may well be wrong. Ten metres opened to the UK for some of our Aussie friends, I gather, but I was happy to work a few VEs and some VK/ZLs on ten by backscatter (I guess - I could only hear them when I was beaming to NE anyway). Countries wkd: 3B9, 5B, 9H, 9J, 9M6, 9V, G/GW/GD/GM, J3, J6, J8, V5, VE1-7, VE9, VK2/3/4/6/7/8, VO1, VP2M, VP8, VP9, VQ9, VU, VY1, ZB2, ZC4, ZF, ZK3, ZL1-4&6. Oh and a few lucky JAs, BAs, Ws and DLs, naturally! DL1T was extraordinarily persistent, pestering me for ages but in vain for a QSO on two bands with his very loud, very annoying signal (turns out that was in fact ZL1T with a slow TX/RX changeover relay consistently knocking out the whole of his first dash!). One RW6 station must have tried likewise for about 10 mins, changing his TX freq every over and no doubt wondering if his TX was still working and/or my RX was broken. These and several others really ought to listen more for those subtle little clues such as “CQ BERU BERU BERU BERU TEST” and “BERU TEST ONLY UK/VE/VK PSE” (sometimes at ~12 wpm to give them no excuse!). On the other hand, a polite JA stn who waited for a lull to give me a quick report was fine and I took pity on a few others this year if they were at least courteous enough to wait until there were no BERU callers. I even found time to bag a couple of non-BERU Caribbean stns just for kicks. Mni thanks to ZK3OU and ZK3YA who worked me pileup-style and then gave me the BERU numbers when prompted. Thanks also to 3B9WR for calling me on 2 bands: what a buzz! I was pleased to work few VUs again but still no 4S7 nor ZS. And finally thanks to Nigel G3TXF for re-sending his call just to confirm he really wasn't somewhere exotic this time! Hit a brick wall 90 mins before the end and sloped off for a little rest that ended up being a big sleep. Next year I must remember not to install a deer gate and fencing just before BERU (doh!). My final position was 26th overall and 3rd ZL , just behind Frank ZL2BR and Brian ZL1AZE with only 75 points separating us three and Holger ZL3IO just below - tight grouping for sure. 5,910 points was my final tally for 2010, just 1.5% lost. More info on G3PJT’s site. CDXC LF Challenge: for some reason, my heart just wasn’t in it this year. Finished a disappointing 21st out of 50 entrants. I’m glad I supported the event but I know I should have tried harder and done better. ARRL DX CW: quite a buzz this weekend with great condx on 15m and 10m in good shape to NA as well. Worked just 2 shy of 1,000 QSOs, claimed 537k points and filled several new WAS band-slots (though sadly not ND). Awarded 519k points, and was pipped to the post by John ZL1ALZ with 561k, leaving me SECOND of 2 in the not-exactly-hotly-contested ZL QRO section. CQ WPX RTTY: I entered this contest partly because conditions were [relatively] good so there were plenty of RTTY stations to work but mostly because I need the practice with N1MM and MMTTY. My 172 QSOs gave 73,000 points claimed (66½k scored) and an embarrassing 4th place out of 4 ZL entrants but the casual, low-key entry left me enough free time to rescue an orphaned lamb from the forest (now named “Ritty”) and clear out the spring that supplies our water. Had a play in the 40m leg of the VK/ZL RTTY Sprint. Was a bit of a struggle with only the vertical antenna - less than ideal for high angles (was easier working UA0IT just before the contest than some of my compatriots!). Still, was worthwhile for the RTTY contest practice, and I ended up FIRST in ZL for the 40m-only section. CQ WPX SSB: other priorities meant a part-time single-band entry on 15m this year. Made 770 QSOs and claimed 871,832 points. Placed FIRST in ZL but it’s a hollow victory as I was the only ZL 15m single-band entrant! AH7DX’s record of more than 7½ million in 2000 is hardly under threat! CQ WPX CW I entered single band 15m, single op, assisted, high power. Made just under half -a-million points from a bit over 500 QSOs. It was hard going on the Sunday with only mediocre sigs from North America and hardly any from South America. Placed SECOND in Oceania a long way behind VK2IM’s 3.1 million points on 40m. ARRL FD: although I can’t actually enter the US/VE Field Day, it was a good chance to fill in a few missing WAS band slots and surprise a few FD entrants with a DX call. I fondly remember my first ever contest - RSGB NFD in 1979 with the Sutton and Cheam RS. 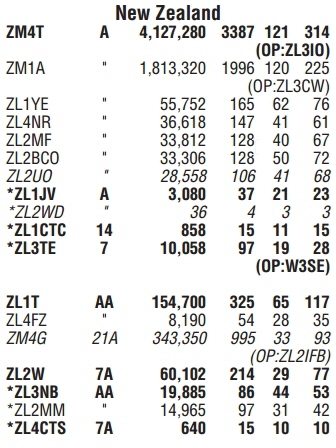 I sure hope the buzz from working a ZL persuades a few NA contest initiates to take up contesting too. IARU contest: this was a casual CW-only entry as once again I had other things to do during the day - specifically building a fence to keep the animals away from my TX antennas - but I made over 600 QSOs and enjoyed the conditions. On 20m around dusk, I turned on QSK to explore the open paths by listening for my own signal coming back. The long and short paths to North America (SW and NE of me) were both open for about an hour, while the paths to JA and Europe (NW and SE) were more or less closed. It’s a bit disconcerting to hear my received signal at a similar volume to the sidetone so I found myself holding the rig in TX on the PTT footswitch while sending callsigns and exchanges. There is a strange problem with computer keying in QSK mode: the PC keys the amp change-over relay OK but doesn’t key the rig, even though the MM3 keyer connected in parallel does both. I really ought to get that sorted before the next contest. On 80m just after dusk, we had one way propagation: there were strong signals from the US but most of them couldn’t hear the ZLs calling. This resolved an hour or two later. Anyway, my final claimed score of 357k won’t win anything in the multi-op section ... unfortunately, there is no “single -op assisted” category in this contest, and the multi-op section is only mixed-mode. YO DX: did just a few hours CW on 20 & 40m around ZL dawn/dusk, scoring 40,656 points. Score table --> Either I forgot to submit my entry (quite likely) or they lost it, but I was not listed in the results. Either way, I think I would have placed about 22nd in the non-YO QRO single-op multi -band section, and FIRST in Oceania and ZL. CDXC HF DX Challenge: it was just a bit of fun. All Asia SSB: I didn’t actually enter this one but picked up a few more DXCCs for the CDXC HF DX Challenge. Oceania DX Contest SSB & CW: I operated both sections with my friends at the contest club ZM4T. We had a lot of fun and did rather well, hopefully setting ZL records in both sections. It was also good practice for the CQ WW DX contests. CQ WW : I participated in the CQ and SSB legs with contest club ZM4T. 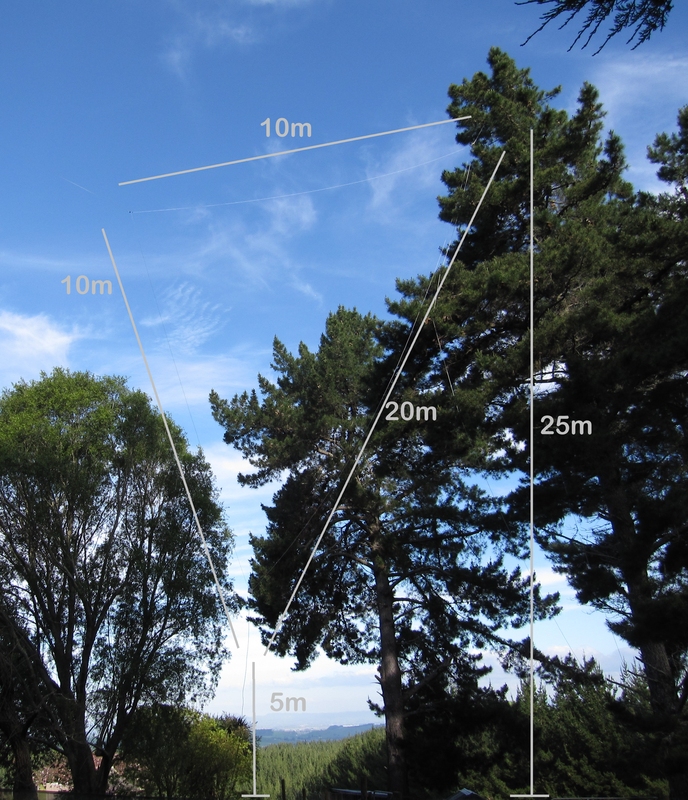 BERU: the ups - I finally got the tribander installed on Saturday, just in time; ZL2BR's BERU predictions were good once again, just missing the path to 9M/9V around 00-02:00z on 20 + 15m; FB Hawke's Bay QTH - so nice not to live in a valley; worked lots of old pals on 80-40 -20 and can still remember most of their names; worked VE7RAC, VK4WIA, ZL6A, plus GB5CC on 20m, for HQ bonuses; made a single 5-bander with ZL1AZE; was called by ZS2DL on 20m at 11:02z, for my very first CQ Zone 38 QSO here in ZL; had a "spare" (4th/non -bonus) VU QSO on 20m for once, though no 4S; was lent a spare rig but didn’t need to use it (TNX Lee ZL2AL); not too much QRM, just enough to remind me why I bought those IRC filters and where the Reverse-CW button is; polite callers, willing to persist until we completed; hand-logged QSOs with around 70 Johnny Foreigners who evidently hanker to join the Empire and refused to copy repeated hints that I was working “BERU RSGB TEST VE VK G ZL ONLY”! Managed to faze some by sending their call once with ENN in the hope they would buzz off until after the contest; filled some more band-spots (thanks J88DR, H40FN, 6Y8XF, 9H3JT and VQ9JC). Downs: only had time to rig up the 80m inv-Vee at 11m off the tower, running N-S; had to hand-rotate the beam with a rope as I'm 10m short of rotator cable (doh! ), necessitating a dozen dashes up the little hill and causing a few missed Qs; missed 9J2BO completely (DXcluster would have helped I'm sure); tired from climbing the tower and hill, needed 3 hours kip on Sunday morning and lost the will to contest for the last half hour of BERU; had to hand-score in Excel since N1MM hasn't a clue. Equipment: TS850, Amp Supply Co LK550 amp, Cushcraft A3S at 14m, 40m roach-pole vertical, 80m inv-V at 11m and my trusty MM-3 Morse Machine. 326 QSOs plus 2 dupes, 152 bonuses, final score = 4,455 points , placing me 36th out of 138 in the open section. Team ZL placed 4th of 7 teams. Excellent write-up here. CDXC LF Challenge: I placed 13th out of 41, I think, enough to win another certificate (which never showed up ...). CQ WPX SSB: not being a fan of SSB, I didn’t take part seriously in this contest but took the opportunity to fill in a few SSB DXCC band-slots (plus some new CW slots too!) and complete the installation of a rotator. CQ WPX CW: 10m condx have been up and down the past month so finding the band quite lively at the start I took a gamble on doing a single-band entry. After a reasonable opening run , it just faded away and after the first four hours I only made 3 further QSOs for the remainder of the contest. 69 QSOs and 53 prefixes made 10,441 points claimed. IOTA: first real run for the K3, worked like a charm. Also tried Win-Test for the first time - seems OK but hard to justify the $$ compared to N1MM. And this was the first outing for ZM4G - that worked well too, quicker and easier than ZL2iFB, though some struggled with the ZM and a few asked where I was. Made about 475 QSOs in 10 hours (QRO single op assisted multiband CW 12h). Not enough mults (60) - spent too long working the pileups and not enough chasing mults on the band map. Lost a disappointing 9% of my claimed score in checking but placed FIRST in Oceania and 4th worldwide. Waitakere Sprint SSB: I saw this one advertised and decided to give it a whirl for a change. It’s an hour-long Saturday evening contest on 80m for VK/ZL/Oceania stations. My fairly low 80m dipole worked fine for this event but I’d be more competitive if it was oriented side-on to VK, not end-on! Still, my 40 QSOs gave me joint 4th place in ZL and 12th overall in the SSB event. I missed the CW one entirely but I’ll have to give it a go next time. Oceania DX Contest CW: operated with my international group of friends at ZM2M and put on a jolly good show. Operating split on 40m was interesting - seems there are many hams out there who flock to work anyone working split, regardless of who they really are :-) Got grief from other ZL entrants though, and will have to move up the band next time I try that! CQ WW SSB: I joined the lads at ZM2M for this fabulous contest and had a whale of a time. We set ourselves a target of 3,000 QSOs, estimating that this would be enough to beat the current ZL multi-two record, and thanks to good long runs on 15m we ended up with over 3 ,500 QSOs. LF condx were poor, especially with heavy QRN on the second night, but still I’m pleased we went to the trouble of building and erecting a topband vertical with a decent set of earth radials. CQ WW CW: I rejoined the Voodoo contest group in Freetown, Sierra Leone for CQ WW CW 2009, operating 9L5A in the multi-two category. All five ops got on well as a team, ably supported by our new best friend, 9L1BTB Zbig- a star! He helped us immensely. With the normal Voodoo equipment stockpile temporarily stuck in 3X, we were forced to take all the equipment (including 3 x K3s and 2x Alphas) plus three portable beams and wire antennas for the LF and WARC bands, on the plane with us to Africa from three other continents (Oceania, America and Europe). The hotel QTH that had been selected previously worked very nicely with a clear view from the roof across the Atlantic in the main two directions. We scored around 19m points, achieving world SECOND multi-two ... and FIRST in 9L (only entrant!)! ARRL 10m: not long after returning home from the 9L trip, 455 fabulous QSOs and 76 fantastic multipliers gave me 138k points claimed and a great big grin. DXCC: not really a contest as such but I had a good and very enjoyable year achieving many new countries and band/mode slots. Clublog DXCC league: the excellent Clublog lets DXers track our performance in relation to our peers through the DXCC league. I enjoyed a year-long friendly competition with my friend and fellow KiwiDXer John, ZL1BYZ - we were neck-and-neck all year. CQ DX Marathon : once again using AD1C’s program to extract the data from my log, I successfully entered this year and (after a friendly exchange with John K9EL) had my entry confirmed on the official list of entrants. AD1C picked me a W QSO for zone 6 (XE) for some obscure reason - must check the log ... aha! Seems N7TR, NX6T and a few other Ws have [mistakenly] confirmed they are in CQ zone 6 via LoTW. Oops. Claimed 229 countries plus all 40 zones worked in 2009, total claim 269 points. Placed FIRST in ZL and zone 32 ( out of I don’t know how many entrants, presumably not many at all!). 22nd overall I think. CQ 160 CW: had a brief play but my topband antennas are clearly poor radiators and the amplifier was playing up too. More work needed to be even vaguely competitive. No entry. LZ DX: worked a handful just for the hell of it, and then got spammed by the contest organizers expecting me to enter ... No entry. UBA: worked about 50 to fill in a few ON band-slots. No entry. ZL Jock White Memorial Field Day: worked a handful, then discovered I should have been giving out branch 00 not 48 since I was a fixed station. Oops. Must read all the rules next time ... no entry. BERU: interesting, my first ‘multi-op’ BERU entry since I used DXcluster. I had a reasonable start at 11pm local, worked through the night and took a couple of hours sleep around lunchtime the next day. Things were really slow going in the afternoon with no joy working the Africans behind the hill, so I took a long walk and contemplated calling it a day. In the end, I came back before dusk to find 40m open to G-land but although there were lots of G signals , they were all very weak (S-zeroes). 4,515 raw points x Southern Hemisphere Fudge Factor = 6,601 points claimed. CQ WPX SSB: I wasn’t planning to enter this one ... but got carried away. After logging 100 QSOs in Logger32 which is pretty hopeless in a contest situation, I changed over to N1MM, an “interesting” move. N1MM successfully imported the ADIF log extract but somehow I messed up the serial numbering. I couldn’t convince N1MM to continue numbering >1, and for some reason it wanted to restart at 1 on each band. In the end , I ignored the suggested serial number and simply used the QSO number at the bottom of the screen. The first day was a blast with good runs on 15 & 10m. Overnight, we had a power cut but luckily the generator works well and seemed quite happy to power the linear (with better regulation than the house supply in fact!). On the final day, the bands were comparatively terrible. I was unable to run on any band; 4 0m was full of EU sigs but due to their local QRM, only a few could even hear me; 10m was open with half a dozen W beacons audible but only a handful of W stations to work. Still I slogged it out for just under 1,000 QSOs in total. Final score was 1,123,864 points, 948 QSOs and 376 mults, placing me FIRST in ZL and 44th worldwide but it’s a hollow victory since the 2nd and 3rd placed ZLs were both using low power: well done to my pals ZL1BYZ and ZL4PW. CQ WPX CW: I can’t remember much about this one except that I made FIRST ZL and 9th worldwide. CQ WW CW: I had a brief play on 40m from home, then went to ZM2M to help their casual Multi/2 entry. 40 + 80m were fabulous, again, and even 10m opened to JA for nearly an hour . CQ DX Marathon : I entered even though I wasn’t actively chasing it and spent a few months off air while moving home. My score of 231 was enough to win ZL but about 100 shy of the leader - a very impressive lead! AD1C’s useful program to extract CQ DX Marathon info from an ADIF log made it easy to find the new ones, although pasting the data into CQ Mag’s official entry spreadsheet was awkward because it is password-protected which stopped me pasting in the selected data. BERU: although my entry was rather disappointing, I was glad to be a part of the winning ZL team (the Call Blacks) with a nice commemorative medal for my efforts. CQ WPX CW: despite having an eminently collectable callsign (E51iFB), this was another very disappointing effort, thanks to me being the wrong side of an enormous chunk of Rarotongan granite from most of the accessible population centres. I only managed 51 QSOs in a couple of hours on the Saturday evening, on 40m only using a vertical in a palm tree by the beach. To make things even worse, the entire E51iFB log was subsequently lost in a puff of logic due to the sudden failure of the laptop’s hard drive (lesson learnt!). Oceania DX Contest CW: I started this contest with good intentions on 40m & 80m but lost the will to continue at around 1am local when the amplifier antenna changeover relay started sticking in the TX position. There was just enough leakage in the RX path to hear strong signals but I guess they were about 30-40 dbs down on normal. I fixed the amp with a surplus Jennings vacuum relay during Sunday and rejoined the contest for dusk. All in all, 356 QSOs are in the log, all of them on 40+80m. Despite the overnight problems, I was placed third in ZL (behind ZM2B and ZL1BYZ) with 516,350 points and 230 multipliers. CQ WW SSB: made a token “all band single op assisted” entry - just 49 QSOs with 26 zones and 31 countries, claimed 6,327 points. Placed THIRD out of 3 in ZL. The UBN report shows 100% accuracy for once! CQ WW CW: in conjunction with my pal and fellow ex-pat Phil (VK4BAA ex -G0HSS), we completed some antenna upgrades and entered as two single-op single-band entries from my home: Phil doing 15m and me on 80m. Receive problems on the low tribander, coupled with lousy condx, gave Phil a hard time. He had a 40m quarter wave vertical and loop to fall back on but missed the beam’s gain. We didn’t have time to rig up the 5 -ele 15m monobander, unfortunately. I had it much easier on 80m with a decent choice of antennas: a topband doublet up the hill, an inv-Vee dipole in the trees out front and a bent 80m quarter wave vertical that is evidently too bent to work. The inv-Vee did most of the work. FIRST Oceania & ZL . Set a new Oceania record on 80m QRO single-op assisted with 202,895 points from 680 QSOs, 32 zones and 85 countries. ZL Jock White Memorial Field Day: I joined ZL6QH. ZL FD is ‘different’ to NFD in G-land. It’s 40+80m only and as activity levels are so low, we’re allowed to work each other again every hour. The station requirements are similar, simulating emergency conditions. CQ WPX CW: entered as VI9NI, a DXpedition to Norfolk Island. Despite the special event callsign celebrating the 150-year arrival of the Pitcairn Islanders in 1856, and some decent CW contest ops, we did quite badly - just didn’t seem to be getting out for some reason. Bad coax or something. 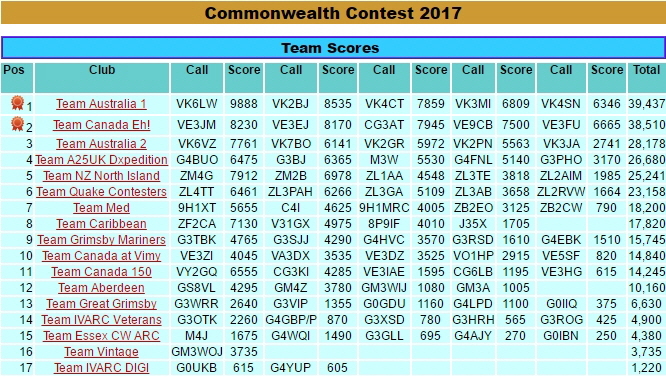 Placed SECOND in Oceania (behind ZL6QH) with 3,063,995 points from 1,530 QSOs and 565 mults (and FIRST in VK9N!). CQ WPX SSB: entered single op low power 15m monoband. Scored 2,010 points from 33 QSOs and 30 prefixes in 3 hours of casual operation. Not my best effort but enough to win the category (however with no other entrants, I also came last!). Oceania DX Contest CW: entered the multi-multi section at ZL6QH with Brian ZL1AZE, Wilbert ZL2BSJ and John ZL1BYZ, all top-notch CW contesters and DXers, and really nice blokes too. CQ WW SSB: part of the multi-multi team at ZL6QH not long before the diggers moved in to install a forest of wind turbines. Placed FIRST in Oceania with 5,980,928 points from 4,668 QSOs, 144 zones and 344 countries. CQ WW CW: single-op assisted, 40m single band, QRO from home. Scored 840,712 points from 1,943 QSOs, 35 zones and 117 countries. Placed FIRST in Oceania , setting an Oceania record and 5th worldwide. CQ WW CW: ZL6QH multi-multi with ZL2BSJ, ZL1TM, ZL1BYZ, ZL2AGY and ZL1AZE. FIRST Oceania , and lots of fun! Scored 10,414,813 points from 6,336 QSOs, 154 zones and 445 countries. This was the year we emigrated to ZL! CQ WW CQ: multi-multi with the Voodudes from a hotel roof in Ouagadougou, capital of Burkina Faso. Scored 36,947,232 points from 15,560 QSOs with 187 zone and 677 DXCC band-slots. Placed 2nd world I think. CQ WW SSB: multi-multi at M6T - 29 million points, FIRST G, EU and zone 14 and EU MM, G and zone 14 records. I operated 160m again. It was a real blast! RSGB HF NFD: Gravesend RS - second restricted behind GM3POI/P this year! CQ WW SSB: G0KPW (now M6T) multi-multi. FIRST G . I operated 160m and got 67 countries on a quarter wave vertical. CQ WPX CW: 28MHz QRO single op, claimed 66k points, results lost. RSGB AFS CW: CDXC - placed second out of 70 clubs, I was 6th of 304 entrants. RSGB AFS SSB: CDXC - placed third of 77 clubs, I was 9th of 186 entrants. RSGB HF NFD: Gravesend RS - FIRST restricted, won the Bristol Trophy yet again. IOTA: 12 hour mixed - placed 5th of 36, second G.
RSGB SSB FD: Gravesend RS - restricted, claimed 303k points, results lost. RSGB 2nd Topband: placed 5th of 44. RSGB 1st Topband: aborted entry when amp blew a coupling capacitor. RSGB 1st Topband: placed 7th of 48. RSGB HF NFD: Gravesend RS - FIRST restricted, won the Bristol Trophy again. RSGB 7MHz DX CW: placed 19th of 46. RSGB AFS CW: DXC - placed third of over 100 clubs, I was 18th of 343 entrants. RSGB QRP Fixed: technical disqualification from 11th place for having a QRO PA (though I didn’t use it - doh! I was using the transverter output from the TS850’s driver stage with maybe 1 watt out - probably much less). CQ WW SSB: 160m single op - details lost. CQ WW CW: chased DX instead of entering. RSGB 2nd Topband: claimed 892 points, results lost. ARRL 160m CW: placed second ... albeit only 3 UK entrants! RSGB Summer Topband: placed 6th of 32. CQ WW CW: GW8GT multi-single - 3.9 million points, FIRST UK. CQ WW RTTY: GW8GT multi-single - 1.7 million points, second world, FIRST UK. CQ WPX SSB: GW8GT - 80m single op - 1.5 million points, FIRST EU, third world, new EU record. RSGB AFS CW: Flight Refuelling ARS - 14th of 90 clubs, I was 65th of 320 entrants. RSGB AFS SSB: Flight Refuelling ARS - 41st of 73 clubs, I was 107th of 141 entrants. RSGB 1st Topband: details lost. RSGB 1st Topband: placed 10th of 32. RSGB Summer Topband: placed 4th of 83. RSGB 2nd Topband: placed 9th of 40. IOTA: GW8GT - 1.8 million points, placed 4th of 37. CQ WW CW: single op 15m at GW8GT - 600k points - FIRST G and GW, new UK record & GW record . BERU: operated GB5CC HQ station at GW8GT. RSGB RoPoCo 1: placed 15th of 55. RSGB County Roundup CW: placed 20th of 39. CQ WPX CW: chased DX instead of contesting! IARU: GB3HQ at Flight Refuelling ARS with G3SQX - details lost. CQ WW SSB: placed 3rd G low power. RSGB Club Calls Contest: Flight Refuelling ARS with my pal Ed G3SQX (now GW3SQX) in Hampshire - placed 6th of 69. CQ WW CW: multi-multi at GW8GT - 17.5 million points. What a buzz! FIRST GW . GW record. CQ WW SSB: at GW8GT - details lost. CQ WPX CW: operated GB2RS demo station at the RSGB radio rally at the NEC in Brum. RSGB NFD: Gravesend RS - FIRST restricted, won the Bristol Trophy again. CQM: first place 20m single op from G.
CQ WW SSB: GW8GT multi-single - details lost. CQ WW CW: GW8GT multi-single - details lost. RSGB HF NFD: Gravesend - FIRST place restricted, won the Bristol Trophy. RSGB AFS : Gravesend RS - 15th of 93 teams. I was 208th of 345 entrants. CQ WPX CW: GW8GT multi-single - 5.9 million points, placed 10th world, 5th EU, FIRST GW again. CQ WW CW: multi-single at GW8GT - 7.6 million points, FIRST GW. GW record . Operators G3OAY Neil, G4BKI Paul, G3SXW Ed, G4VXE Tim, GW4LXO, GW4TTU Kelvin, GW0MAW Norman, GW3NWS Ross, GW4JBQ Julian, GW5NF Roger, GW0CLD, GW6ZUQ Dudley, GW3KYA Brian and GW4iFB me. WRTC: FIRST UK, 7th EU, 12th world. SAC CW: 584th overall, 4th of just 6 G’s. RSGB LP FD: had lots of fun with just 100mW but submitted a rather pathetic checklog. BERU: operated GB5CC HQ station at G6LX Ron’s nicotine-covered place. RSGB SSB FD: Gravesend RS - first of 29 restricted. RSGB VHF FD: Windmill CG - second of 36 open. On 2m (the band I mainly operated) we made 3rd place, despite a solder blob coming adrift in the masthead preamp. RSGB HF NFD: Gravesend RS - third out of 49 restricted. RSGB AFS: 3 A’s B team - placed 58th out of 94. I was 63rd out of 339 entrants. RSGB HF NFD: with G4BUO and G4FAM - placed third of 64 in restricted (the same score would have placed us 2nd in the Open section that year!). RSGB VHF FD: with Windmill CG - placed 6th of 49. RSGB SSB FD: with Gravesend RS - placed second of 34 in restricted section, not bad for the club’s first ever entry in that contest! RSGB 2nd Topband: placed 43rd of 44, missing the wooden spoon by just 1 place. RSGB RoPoCo 1: placed 15th of 50. RSGB RoPoCo 2: placed 26th of 43. RSGB County Roundup CW: placed 7th of 31. RSGB HF NFD - Leicester Radio Society A team placed FIRST on 160m single-band with a genuine 10W, just to prove a point. RSGB Region Roundup - placed 4th of 7 QRP entrants. RSGB Summer Topband - I checklogged for G3SJJ. RSGB 7MHz CW - placed 19th out of 39. RSGB 432MHz AFS - Leicester Radio Society placed 11th out of 21. RSGB AFS - Leicester Radio Society A team placed 21st out of 96. I was 53rd out of 354 entrants. I have lost my notes and only have vague recollections of contesting during this period. I recall several HF NFDs with Sutton and Cheam RS at Tadworth, and VHF FDs at Leek, then I moved to Leicester in 1983. I was at university throughout so really only entered a few club events in the uni holidays. The primary aim of a contest QSO is to exchange only the essential QSO information (normally callsigns, reports and contest-specific info such as zones number, state or serial number) as efficiently (meaning quickly and yet accurately) as possible. In most contests, anything further (greetings, QTH or station details etc.) is superfluous, slows down the QSO rate and reduces the achievable score. If you hear a contest in progress and want to join in, look up the contest rules to find out what info to send and whether you are eligible to participate. Listen carefully before calling a contest station, ensuring that you have their callsign correct and haven't already worked them (duplicate QSOs just waste valuable time). Consciously avoid causing interference for example by transmitting an overmodulated signal, CQing on a frequency that is already in use (remember, listen first and listen hard) or pestering a contest station for a DX QSO that is not valid for the contest (fair enough to call once or twice if the contester is ‘lonely’ but if he doesn’t respond, leave it at that). Don’t operate split in a contest unless it is absolutely necessary to consume extra bandwidth. Call a contest station that is CQing at just the right instant, giving your full callsign once (that's usually enough). Most stations leave only a few brief seconds between their CQ calls so it is important to synchronise your call with their listening periods. Stand by for a moment if they go back to someone else. You shouldn't have to wait very long. If they are really busy, make a note of their frequency and spend a few minutes hunting for other stations to work, then come back for another go. If they send your correct callsign plus a report and contest info, respond with just a report and contest info. However if they send your callsign incorrectly, hesitate briefly just in case they are working someone else but if you are certain they are working you, respond by sending just your full callsign again, once or twice (no report) and they should correct your call. Do your level best to log their callsign and exchange info accurately, and to ensure that they have all your info correct (e.g. repeating the essential information if conditions are marginal). Sometimes several repeats are needed to complete the QSO but this is necessary to claim the points and avoid penalties. Having met the primary aim, you will both be grateful for the efficient QSO and points. It is polite for the CQ station to send "thank you" or "TU" to confirm that the QSO has been logged. This reduces unnecessary duplicate QSOs due to not knowing whether the QSO was complete, and is the cue to move on to the next QSO. Remain courteous at all times, even when you are stressed or tired. If another station encroaches onto the frequency you are using, use your filters, turn your antenna, ask them politely to move a bit HF or LF as appropriate and/or shift your frequency a bit to reduce mutual interference, or take this as an opportunity to go searching for new QSOs on the same or another band. Respect other hams who are not in the contest, for instance by obeying 'contest-preferred' frequencies and avoiding frequencies used by beacons, nets, DXpeditions and other modes. Keep the WARC bands a contest-free safe haven for those who do not enjoy contests. If you are using a club or another ham's station for the contest, be a good guest for example by being careful with the equipment, tidying up afterwards and not annoying other people in the house. Play fair . For example, if you are using DXcluster to find new multipliers, spot multipliers for other contestants too. Single-op entries may be forbidden from using DXcluster so check the rules. Comply fully with the rules of the contest both in letter and in spirit. Don't even bend them . Take as much pride in your station and operating techniques as in the contest certificates and plaques hanging on your shack wall. Learn to take advantage of the propagation and make the effort to listen for weak callers. Most of all, be polite, efficient and friendly and stick to the rules to earn the respect of your fellow hams. Add the program to the Windows startup path so it restarts whenever you reboot your PC. It silently does its thing in the background, hassle-free.